Clive saw an advertisement on the notice board at Middlemore Hospital. "Series IIe Landrover, 1972" I had been beaten up earlier in the morning so it had already been a traumatic day, but Clive was as keen as mustard. He drove me out to Waiuku but we both were dreaming instead of driving across the Sahara. Before the night was out we owned the amazing vehicle which would bring a blend of romance, trauma, and sheer hard work to our lives. Grunt was to make the building of Arakainga possible. 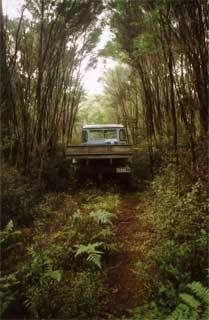 In the sixties every Kiwi dreamed of going "overland". Whether you were going from Cairo to Capetown, or Canrterbury to Calcutta, there was only one vehicle which would do the job. The Landrover. Chance plays a great part in all our lives. The people who make a difference are those who recognise their chance and take it. It always seem odd to me that university researchers, bureaucrats and particularly planners spend the whole of their lives trying to eliminate chance in other people's lives. The world would be so much richer if these dull control-freaks had never existed. People who should be free are forced to waste their time looking for tiny cracks in endless rules and regulations seeking for the least chance of moving civilisation forward. There was a different mood about in Britain after the War. 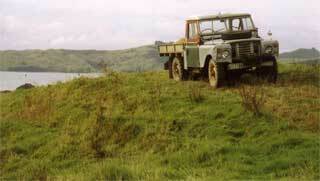 The Land Rover story began with a chance. Maurice Wilks was Technical Director at Rover in 1946. He had bought a World War II Universal Carrier from army surplus, and when a storm damaged trees on his Birmingham farm he used the Carrier to clear them. The forestry worker he had enlisted to help was so impressed with the Carrier that he asked if he could swap it for a chain saw and an old Willys Jeep. Maurice agreed. Maurice also had land on Anglesey Island so he took his Jeep down there, where it performed well and was useful for taking the boat down to the beach. The salt of the beach however took its toll and Maurice's brother Spencer asked him what he was going to do when the rusting Jeep finally packed up. "I'll just go out and buy another" he replied, and then he realised that there was no other. He had identified a gap in the market for Rover to fill. The first Land Rover was cobbled together. It used the 1.4 litre four cylinder petrol engine and the freewheel gear from the old Special 10. along with the gearbox, differentials and drum brakes from the 1937 P2 limousine, as well as numerous parts from other Rover models. Pretty much the only thing which had to be developed from the ground up was the high/low reduction gearbox. The body was made from aluminium because steel was in very short supply after the war, but one result was the elimination of corrosion and the other was the ease of fabrication. The first bodies took only a couple of days to produce and they were built by eye. No drawings were done. In today's world no one could imagine design without drawings. Every Council inspector should read the Land Rover story. Approximate measurements were made, the panels were cut, and they were just fitted together. The Land Rover was originally conceived with permanent four-wheel-drive but the resulting "wind-up" between the two axles caused by the lack of a central differential led to the development of a freewheel by which the front wheels could be disconnected from the drive assembly. The first model had a lever for doing this on the dashboard. To overcome the need for both left-hand drive and right-hand drive models the first two prototype Land Rovers had their steering wheel in the middle. However this was found to be too awkward. On 4 September 1947 the Rover Board gave the go-ahead for a production run of 48 vehicles. The development phase was over. No risks had been taken. Investment had been kept to a minimum. It would be a simple move to convert the production line back to saloon cars if the idea did not find a market. Tom Barton remembered those extremely busy days with affection, "It was load of fun." One of the tragedies of modern life is that so few people are having fun in their jobs. 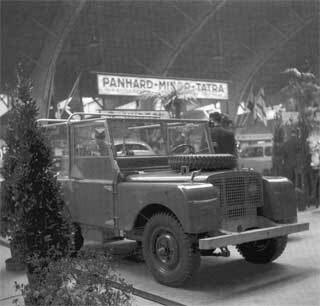 In April 1948 the Land Rover, Europe's first civilian off-road vehicle, made its public appearance at the Amsterdam Motor Show. No one knew how the public would react to what was developed as an agricultural vehicle. Hundreds of orders at the show transformed nervousness into broad grins. No one could have imagined then that the Land Rover would still be in production 50 years later. More than 1.7 million Land Rovers were built before production ceased. Between 1941 and 1945 647,927 Jeeps had been built and although the speed of this wartime achievement was never to be equalled, finally there were many more peace-time Land Rovers. Another vehicle unveiled at the 1948 Amsterdam Motor Show was the Morris Minor, produced by Nuffield and designed by Alec Issigonis. More than 1.3 million Morris Minors were built before production ceased in 1971. A third vehicle unveiled at the Show was the Jaguar XK 120, whose elegant bodywork had been designed in only two weeks by William Lyons. The reputation of British car manufacturing had been re-established after the war with three brilliant vehicles. Ten years after the first model the Series II Land Rover was launched, but the changes were minor. The petrol filler was on the outside of the vehicle rather than under the driver's seat. A metal funnel could be pulled out from the filler pipe to make it easier to fill up from jerry cans. Free wheeling hubs for the front wheels, which could be locked or unlocked spared the drive shafts and differentials which now did not turn unnecessarily when the front wheel drive was disconnected. The Series II had painted window frames. They rusted out on Grunt and had to be replaced. Perhaps they did that all over the world. 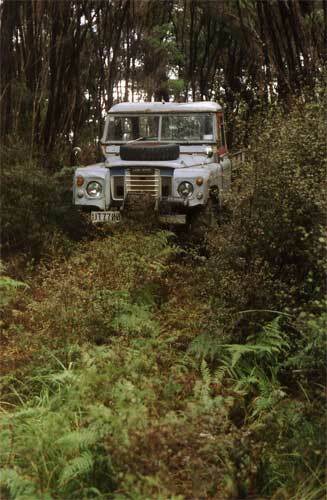 It seemed that the legend would live on forever but the Land Rover was finally killed by bureaucracy. Sales of the Defender were banned in the USA before 2007. and it will cease to exist elsewhere around 2012. Dull faceless people whose names will never be remembered by history decided that they knew more about life than all the people whose Land Rovers had brought them so much joy and pleasure. They decided that the Land Rover was unsafe. There is an irony in all this. I feel extremely safe when driving my Series II Land Rover around the city. I find that other vehicles stay well away. The battered bodywork which has cleared trees off the road when there was no time to stop is clearly not going to suffer from close contact with any vehicle with air-bags and a five star safety rating. No one seems to go through a red light or cut in front after ignoring a compulsory stop. 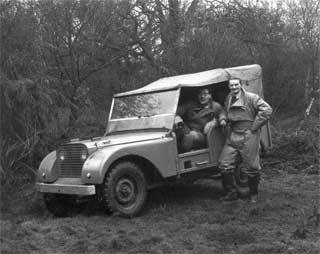 The full history of the Land Rover can be found in "Fifty years of the best 4x4xFAR" by Mathias Pfannmuller and Boris Scmidt, published by Autovision-Verlag, 1998. The photographs of the prototype and the Amsterdam Motor Show are from that book.